You might have already figured this out about me but… I love rice. And when I say I love rice, I mean that if I were about to get dropped off on a desert island and could choose one food to have with me, it would be rice. I've often thought that if I were to ever be on Survivor, I’d be A-OK! So long as I could smuggle in some salt or figure out a way to safely cook with ocean water. Most people think of plain white rice at the mention but that’s not really what comes to mind for me. Now, don’t get me wrong, I love me some white rice. As long as it’s got gravy on it. Much like with grits, rice gets overlooked because people think of it in its most basic state which is bland and boring. But when you cook it in broth, add some flavor and some fat, you've got a whole different dish on your hands. I make rice at least twice a week and thought I’d share with you some of my favorite ways to prepare it. Sauté rice and onion in butter over medium-high heat for about 5 minutes or until rice has started to brown and gives off a nutty aroma. You can add a handful of slivered almonds when sautéing the rice if desired. Add rice and broth to a 1-quart baking dish. Salt to taste if necessary (you want the broth to be as salty as you want your rice). *You can also cook, covered, in the oven at 350 degrees for one hour. Sauté rice and onion in butter over medium-high heat for about 5 minutes or until rice has started to brown and gives off a nutty aroma. Add rice and consommé to a 1-quart baking dish. WOW! What great ideas. 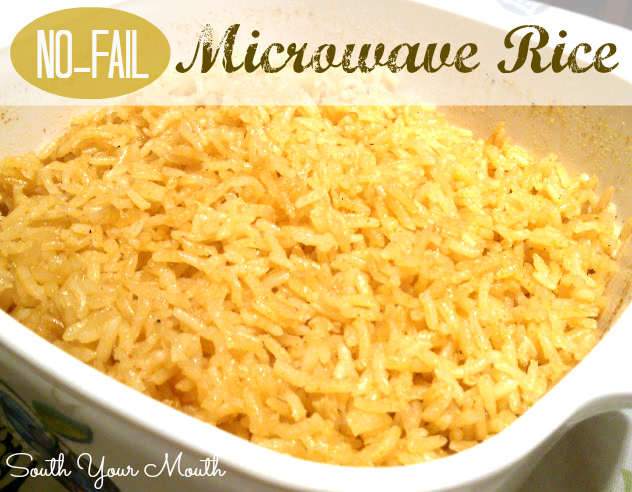 Love these...and the simplicity of making these dishes in the microwave. Thanks so much for sharing at Weekend Potluck. Hmmmm, let me see: I've already "dirtied" a pot for sauteeing the rice, the stove is already warm/hot and cooking in the microwave takes about the same time as steaming the rice on stove-top ... I don't really see the benefit of chucking it in the microwave? Otherwise, those are very nice ideas and probably highly tasty, as all your recipes seem to be. I prefer doing my rice in the microwave. It turns out fluffier.